One day a former co-worker of mine, Angie, posted on Facebook a scratch cooking mission to me of Cheddar and Sour Cream Potato Chips. Mission accepted. 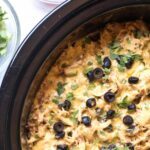 Ok, so these obviously aren’t totally from scratch because we haven’t started making cheddar cheeses yet, and even though I have the cultures waiting patiently in my fridge for sour cream, I haven’t bought the Yogotherm yet that I need to make it. It’s totally on my list because I want to make sour cream and yogurt, but my husband and I are on strict house-saving mode so discretionary funds are have been put on a tight limit. And even though I had decided I’d buy it this past week, that money ended up going towards a super cute Banana Republic coat that was super-duper clearance… two of my weaknesses. So anyway, the yogotherm is still on the list. It’s kind of pushed back a bit further because I may have gotten myself a new pair of shoes this weekend too. I’m so weak. Anyway, this afternoon, I finally had some time to take crack at these chips. How do you make flavored chips? I had no idea. But I figured since it was just potatoes flavored with cheddar and sour cream, that I just needed to mix potatoes with cheddar and sour cream and then bake them into a chip. Sure. 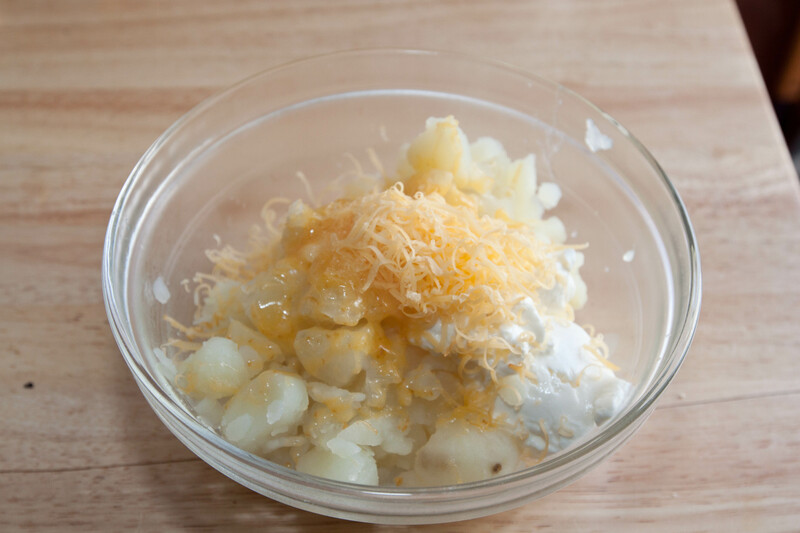 So I peeled and boiled a few potatoes until they were uber soft, then I added about 2 tablespoons of sour cream and about a 1/3 cup of shredded cheddar cheese. Since my mom was just here and we went to the Tillamook Cheese factory, I happened to have some of their smoked cheddar which is soooo good. 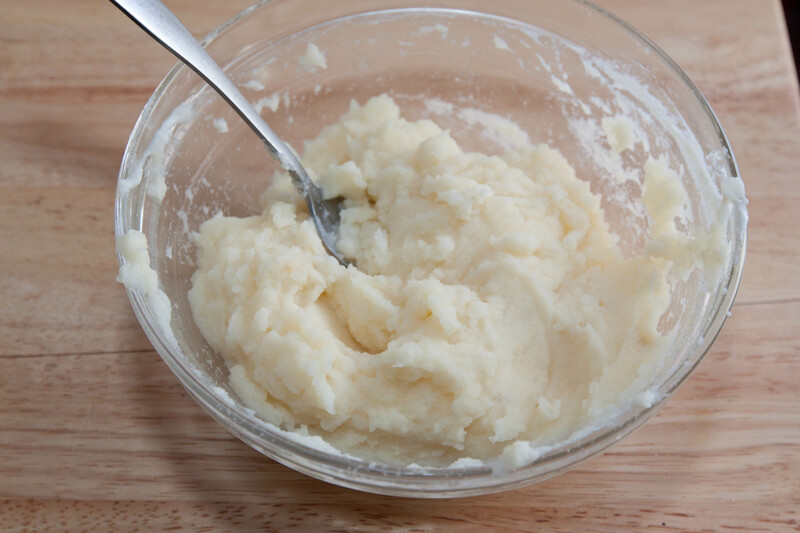 Then I gave it a good mash until I had some super creamy cheddar and sour cream mashed potatoes. 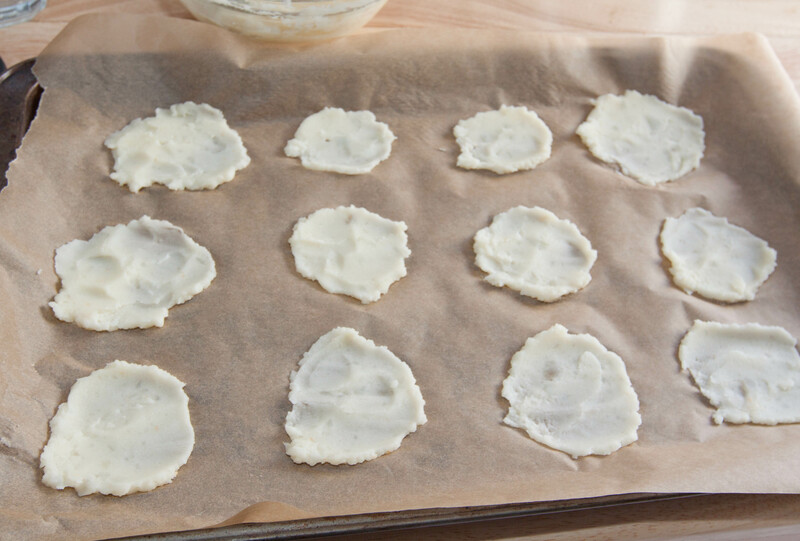 With these mashed potatoes I just spread a little bit out onto some parchment paper into ‘chip’ like shapes. My chip shaping clearly needs some work. I didn’t make that many, mainly because we don’t need that many chips in our house and also because my studly husband was on his way to the gym and hadn’t had lunch so I gave him some cheddar and sour cream mashed potatoes to eat for some workout fuel. Then I baked them at 350° for about 15 minutes. When they came out though, they weren’t crisp, so I decided to finish them, I needed to fry them. A food dehydrator would have been perfect for this chip making process, although our last one broke and the money we were going to use to get another one, I kind of bought new bedside lamps that matched our new bed set instead. My husband did not see the value in having coordinating lamps, but I slowly convinced him how nice it is to have matching bedroom furniture, and by convinced him, I mean he was finally just sick of me talking about these lamps and acquiesced. I did wish I had a food dehydrator for these chips though. Also on our list after the yogotherm. 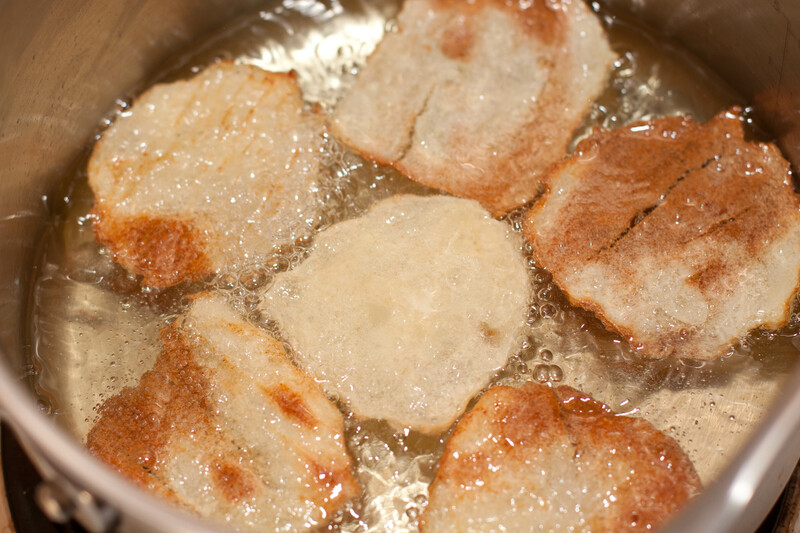 So, then they went into a hot pot of vegetable oil to fry and crisp up. And after about 90 seconds, they were good to go! 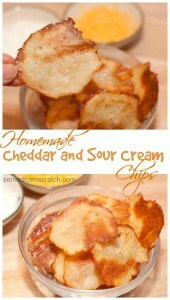 Cheddar and Sour Cream Chips from Scratch! 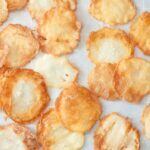 Make your own flavored potato chips with all natural ingredients! Pre-heat oven to 350°. Dice then boil potatoes in well salted water until very soft. 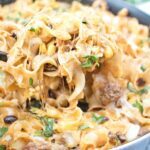 Drain and add to a bowl with sour cream and cheddar cheese. Mash and mix well until creamy. 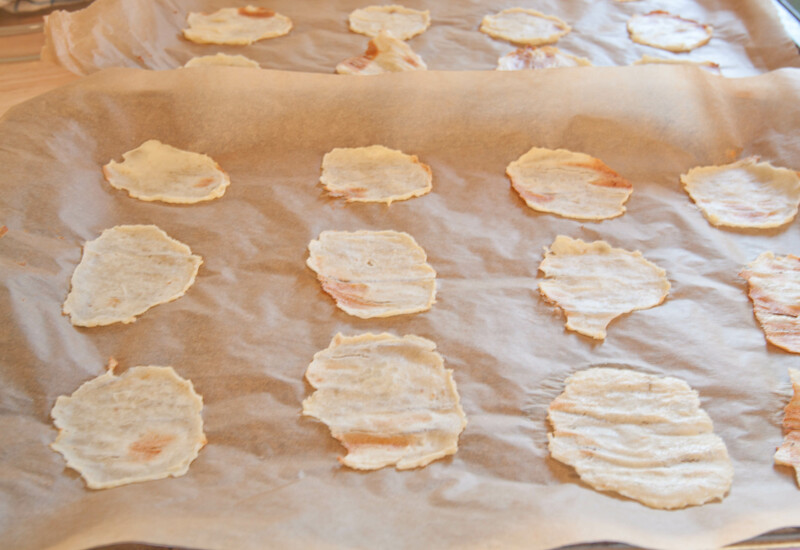 Line baking sheets with parchment paper and with spoon place about half a tablespoon of potato mixture and then spread with spoon very thin into a chip-like shape. Repeat with rest of the mashed potatoes. Bake for 15 minutes then let cool completely. 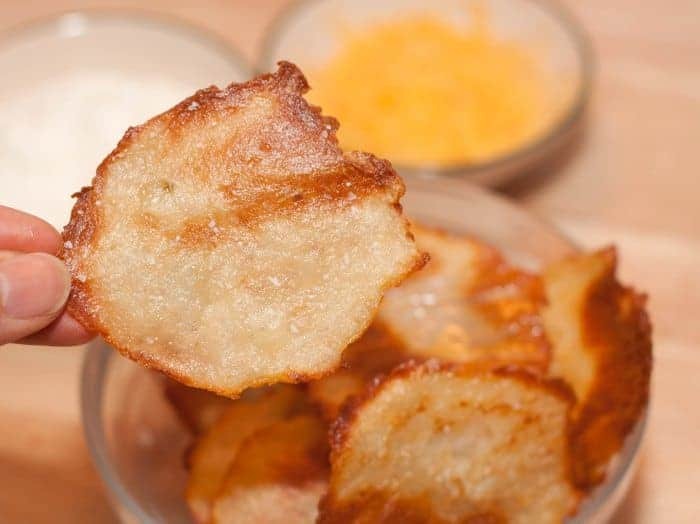 Heat a small saucepan with an inch of vegetable oil and then fry 5-7 chips at a time for about 90 seconds or until edges begin to brown. Remove with a slotted spoon and place on paper toweled plate to drain excess oil and cool. 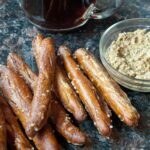 Lightly sprinkle with kosher salt and enjoy! very interesting.. mashed potatoes.. baked then fried..? wow! MMMMMMMMMMMMMMMMMM this sounds SOOOO good!!! HAHA I hear you on the matching bedroom furnature too… Mark doesn’t understand why I want matching nightstands. I’m like “we have a real house now Mark and we’re like, grown ups… our furnature should match”. SO funny. Good job on these though, you make me feel like trying it, cheddar and sour cream is like the BEST flavor EVERRRR. You could make a fortune selling these, do you realize? 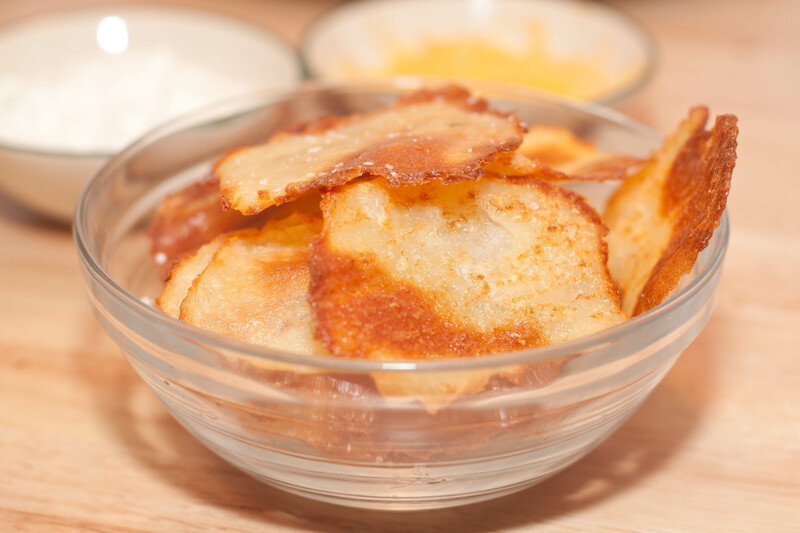 We had homemade potato chips at Taco Asylum in Costa Mesa this weekend and my husband said he would pay 10 bucks for them, they were so good. Haha. I am using your mashed technique/method right now making a giant purple potato chip for my next post. Loads of fun! My husband loves bologna and potato chips, or at least he did when he was growing up, and I’m trying to give a healthy and amusing spin on his childhood lunch. Then next I want to make fresh noodles like you did for pasta. So much fun, right??? Giant purple potato chip didn’t turn out as purple as I would have hoped, but it was delicious. A little chewy and thick, and also homely, but delicious. I’m trying a rye ramen noodle to get rid of my rye flour . . . I’m all rye bread-ed out. I was expecting to see photos of you slicing potatoes, a deep fryer and then seasoning or sprinkling them with this or that. But what a pleasant surprise you provided! I’ve never seen chips prepared in this way, Tracy. F a b u l o u s!! Thank you, Nancy!! I thought of that first but couldn’t think of any thing to sprinkle them with to flavor that wouldn’t be filled with artificial ingredients, so this seemed like the only other option! Yum!! Wow your weaknesses are my weaknesses, super super clearances and matching bedroom furniture. What an interesting idea! They look delicious! Thanks! 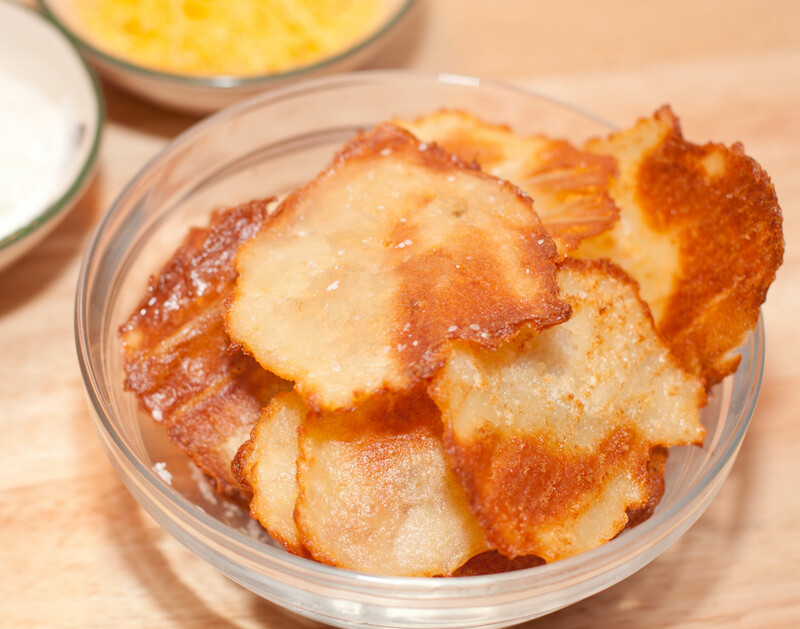 They were pretty tasty although I’ll definitely be using a dehydrator instead next time to cut out the oil, but it’s a pretty cool way of getting flavored potato chips! SERIOUSLY!?!?! You’re making flavored potato chips!?!?! If I wake up tomorrow and find that you’ve taken over the world… I will not be surprised at all, not. at. all! What a cool recipe! I’m definitely up for trying this. I bet this method would work for several flavors of chips too! Thanks for sharing.